When Halloween approaches, parents are usually absorbed with costumes and candy, but playing Halloween games is a great way to make the spooky day fun and festive. Host a Halloween party and try out some of these games with your kids and their friends. These games work well for toddlers and preschoolers. In many cases, they can also be adapted for older children. Toddlers have very active memories, so challenge them with a bewitching Halloween game. Place a bundle of small Halloween decorations on a cookie sheet (perhaps a spider ring, a piece of candy corn, a plastic frog, etc.) Gather children around a large table. Reveal the cookie sheet filled with goodies for 10 seconds. Cover with a scarf and quiz the kids to discover who can remember everything on the tray. The player with the highest correct answers wins. To get the wiggles out of a group of playful kids, set up a balloon pop game. Fill large balloons with candy (helium balloons are preferred.) Pass out one filled balloon per player. Let children sit, play, bounce, and punch their balloons until they pop! Because bits of balloon can pose a choking hazard, make sure this is an adult supervised activity. A great pumpkin hunt can be done similar to an Easter egg hunt. Hide small plastic pumpkins filled with treats or use small treat bags to hide. Time the children and have them racing to find the treats. Older children may enjoy the above games, but they also enjoy more complex games, as well. 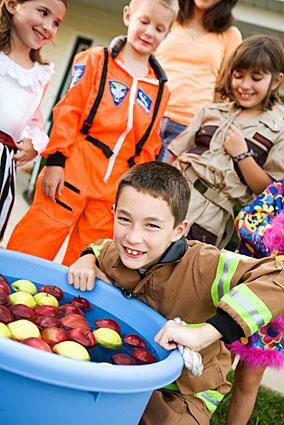 Weather permitting, an outdoor scavenger hunt is a wonderful and active Halloween activity. If you have a thick field or forest within walking distance, plan this event to take place there. Start the hunt by explaining to children that a witch has lost all of her belongings. Hide a broom, hat, cape, stuffed black cat, magic wand, etc. within the field or forest. Direct kids to find each item and place them in a large basket. Once items have all been fetched, walk children to a hide out spot where a "witch" (a costumed adult playing in character) thanks them for their generosity and gives each child a prize from her bag of goodies. Tape a large picture of a pumpkin with eyes and to the wall or door. Create several large pumpkin mouths out of sturdy tagboard. Blindfold kids, turn them in a circle, and have them try and tape the mouth onto the pumpkin. 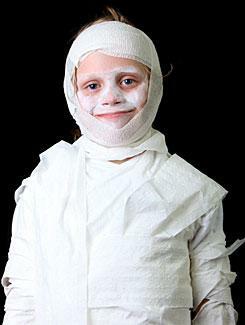 Mummy wrapping is a great game for a group of active kids. To play, divide into groups of two players. Once teams have been formed, pass out two rolls of toiler paper per group. Ask teams to choose who will play mummy and who will play wrapper. The selected mummy will lie flat on his back, while the wrapper scurries with just 2-3 minutes to wrap his partner from head to toe. The team with the mummy who has the most wrap wins! Unless you have a good way to keep these standing up, it might be best to play this game outside. Also, since hay or old newspapers are involved, this game can get a little messy. Place the longest stick or pole (at least four feet tall) into the ground. Gather four poles or sticks. Place the shorter stick or pole across the one in the ground and secure it to the long pole with rope or string to form a t-shape. 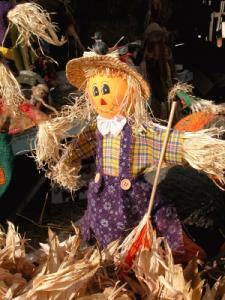 The taller stick is the body of the scarecrow and the pole across are the arms. You will need two of these constructions, one for each team. Have two boxes, each with a pair of pants and belt or a pair of overalls, a shirt, and a hat. Each team can have a bale of hay, pine needles or a stack of old newspapers to use to stuff the clothes. Use blown-up balloons for the scarecrow faces. The balloons can be placed on the neck of the stuffed shirts and covered with the hats as the team progresses in the building of the scarecrow. Have each team stuff their scarecrow as fast as they can. First the clothes are fastened to the poles. To make the clothes stay on the poles, hay or newspapers are placed inside the clothes. The belt is used to hold up the pair of pants. If overalls are used, there is no need for a belt. The team who completes his scarecrow creation first is the winning group. Use a toy spider and a CD player with scary music. Designate child as IT and give him the toy spider. Have other kids sit in a circle facing each other. IT walks around the outside of the circle and quietly behind one of the seated children, drops the spider. Once the child notices the spider behind him, she jumps up and runs to try to catch IT. If she catches IT, she is safe. If IT gets to her place on the floor first, the child is the new IT. Prepare a shoe box (the mummy's tomb) with something spooky like plastic spiders or bats inside. Tape the box and cover it with about a dozen layers of bright orange wrapping paper. Have children sit in a circle on the floor. Pass the wrapped present around as music plays. Let the children unwrap the present only when it is passed to them and the music stops. Once the music starts up again, they must pass the present around in the circle. The child who completes the unwrapping of the present and opens the box during his turn, is the winner. Older grade school and early middle school kids will enjoy the following games. Fill a big tub with water and float fifteen to twenty apples in the water. Each child takes turns trying to get an apple with her mouth without using any arms or hands to assist. Kids should expect to get wet because that is half the fun. Another great game for older kids is a haunted house. This takes some planning, but kids enjoy creating the scenes and then watching others going in and getting a fright. Use a basement or garage to create the space and provide plenty of adult supervision to avoid injuries. Have a pumpkin decorating contest with older kids. This can include carving, painting, or decorating pumpkins and is usually a timed game over thirty minutes. Set out knives, markers, paints, and other decorating tools for kids to choose, then set the timer. Prizes can be given for the best, scariest, weirdest, or cutest pumpkin. Make a gross guessing game by placing gooey or odd feeling objects into individual bowls. Cut small holes into the box that are large enough for small arms to fit through, and hide the bowls behind the box. Blindfold each child and let her put an arm into each box trying to guess the contents. Use cold noodles, cold cooked oatmeal, Jell-O, an uncooked piece of liver, or any other ghoulish concoction that might give kids a small Halloween fright. Some things to keep in mind when you are planning to play games with kids is to have fun. The kids will enjoy the evening more if you are enjoying yourself, too. If possible, try not to plan a party where you will be the only adult supervisor. Get a spouse, another mom or dad or friend to help out with the games. Encourage the quiet child to participate. Always have phone or cell numbers of where parents can be reached if parents decide to leave your home. Make sure they know when to return to pick up their child. Serve refreshments in between playing the games. Having prizes for the winners of the games makes things more challenging. Your prizes can be small items that have to do with Halloween - a pencil with a Halloween design, fake plastic teeth, or some candy will be appreciated. Hopefully, each child will have had a great time playing these Halloween games.